The Colorado GOP held conventions this weekend to select delegates. Ted Cruz did very well. The Colorado Republican elites handed Cruz 30 of the 37 delegates across the state. The delegates are legally bound to support the Texas Senator on the first ballot at the convention. Four other delegates gave him verbal commitments of support. The Colorado Republican voters were not involved in the distribution of delegates. The GOP elites were very happy to give all the delegates to Cruz and tweeted about it. 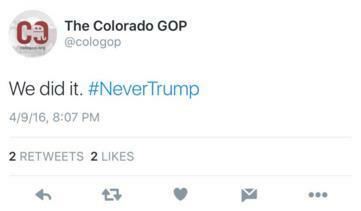 The Colorado Republican Party claimed they were hacked. They claim it was an unauthorized user. No doubt, the Cruz supporters think this is hilarious.